Hanoi (VNA) – Vietnamese athlete Bui Ba Hanh will run with the world’s fastest man Usain Bolt at the International Association of Athletics Federation World Championships, which will be kicked off in London on August 4. Hanh is the only representative from Vietnam at the event, which will last until August 13. The runner from the Army club will take part only in the men’s 100m, where he may have a chance to vie with the Jamaican athlete. Bolt will be participating in the 100m and 4x100m event in London. The heats for the men’s 100m will be organised early August 5 morning, Hanoi time. 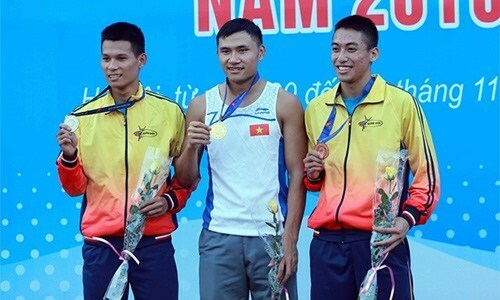 Hanh was the second fastest man from Vietnam behind Southeast Asian (SEA) Games winner Le Trong Hinh, who is now struggling with an injury after a road accident in February and could not take part in the London tournament. Hanh secured a silver medal at the national championship last year with a timing of 10.61sec. The result places Hanh at the No. 55 spot among 66 participants.